Island hopping in Croatia is certainly trending, as visitors want to pack as many experiences and memories into one trip as possible. Croatia has more than 1000 islands dotting its long coastline and there is a collection of islands near Split that are the most pristine on the Dalmatian coast. 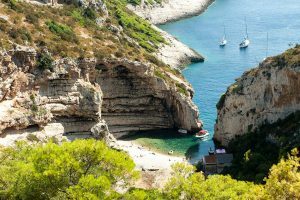 With their near proximity to the mainland, these Croatian islands can be discovered with one-day or half-day island tours from Split. The island of Vis lies the furthest out on the Adriatic from Split, but you can still experience it for the day with the Blue Cave and Hvar Tour by Šugaman Tours that takes you to five destinations enroute. Due to the outpost position of Vis, it was a military base under former Yugoslavian leader Tito’s rule and thus was closed to visitors for over 50 years. The result is an island rich in culture and untouched by tourism. 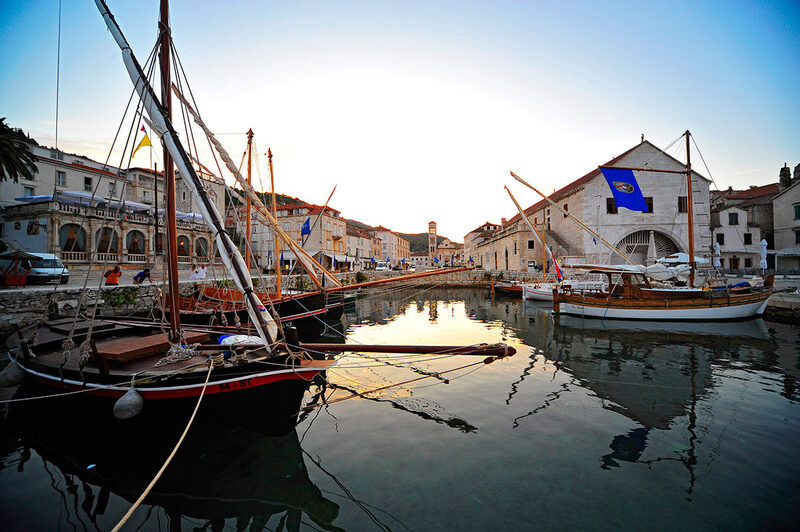 The charming fishing village of Komiža with traditional Falkuša boats bobbing in it port is a picture perfect example of how time has stood still on Vis. Along the jagged shores of Vis is the Stiniva Cove, a 600m pebble beach bay enclosed by steep cliffs that dive vertically into the Adriatic. Beyond the coastline you will also explore the Blue Cave on Biševo Island, where the flow of light into the grotto creates a natural masterpiece of bright blue light. There is also plenty of time for a shaded swim in the Green Cave or some underwater exploration by the nearby Budikovac Island. As we turn on the engines and leave Vis behind us, you will soon arrive in the Palmižana bay, on the island of Sv. Klement in the Pakleni Island archipelago for a swim. The Pakleni are a collection of 14 uninhabited islands near Hvar, a dazzling piece of nature with crystal clear seas and countless little spots where you can surely find a spot of seclusion. 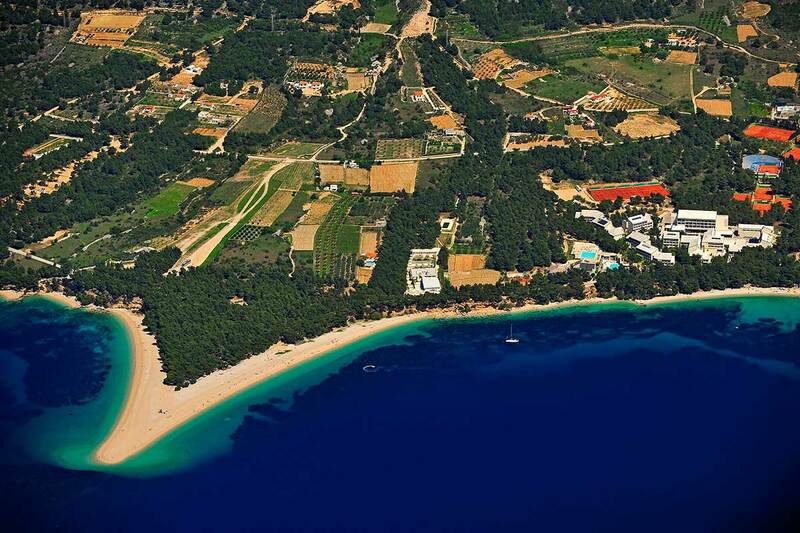 The Palmižana bay is the most pristine, a botanical garden that has been cherished by the Meneghello family for generations. They named the bay Palmižana after their private palm oasis on the waterfront, sporting almost every variety of palm tree there is! The oasis is home to Toto’s Restaurant, where bathers can take refuge over gregada, a local dish that combines whitefish, potatoes, white wine, and olive oil into a delicious pot that has been shaken, not stirred. Before returning to Split, wander through the winding streets of Hvar Town on the island of Hvar just across from Pakleni. 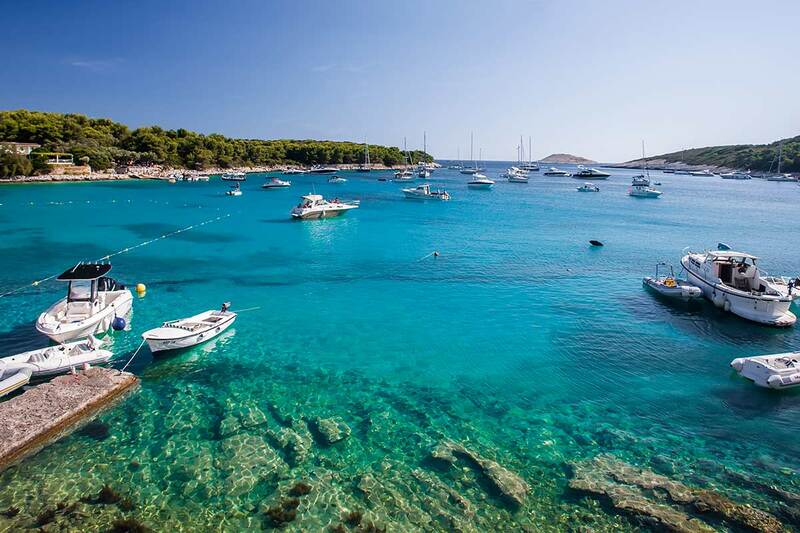 Hvar Town is known as the elite tourism destination of Croatia where celebrities such as Beyoncé and Price Harry like to party it up in Carpe Diem and Hula Hula Beach Club. Between cocktails and raving on the edge of the Adriatic, explore Hvar’s maze-like backstreets lined with more than than eight centuries or architecture, craft shops, the must-have-a-bite Nonica patisserie, and the Arsenal theatre that beautifies the palm-dotted waterfront. Brac has gorgeous beaches, charming old towns and diverse historic sites. If you prefer a more relaxed setting rather than the glitz which the nearby Hvar Island is known for, then Brac could be just ideal for you. Often referred to as the jewel in the crown of the Dalmatian Coast and compared to the iconic Cote d’Azur, Hvar Island is quickly becoming one of the top holiday destinations in Europe. If you want to enjoy the sound of waves crashing and the tranquility of lush green forests without being surrounded by a big crowd of tourists, then Vis Island may be the ideal place to visit off the Dalmatian Coast. Away from the city, the most beautiful group of islands in the area is not far with speedboats. Discover forest-covered islands immersed in crystal clear water. The nearest island to Split is Brač, often referred as to the island continent due to its mere size and the numerous townships that each has their own identity. The ancient settlements that dot the island ooze with cultural charm, calling for a one-day private boat trip from Split. By tourists, Brač is most famed for Zlatni Rat, a white pebble cape beach that juts 624m out into the sea in Bol and although stunning, beyond tanning on the glittering shoreline are a collection of settlements, wineries, and sites waiting to be discovered. Brač is also well-known for its quarrying traditions, and the white rock from the island has been used to construct Diocletian’s Palace in Split, the Whitehouse in Washington and Reichstag in Berlin. Take a stroll through Pucišca, home to stone-masonry and voted in the top ten of most beautiful small villages in Europe; built on stone, from stone, by stonemasons and has a century old stone-masonry school on the seafront. 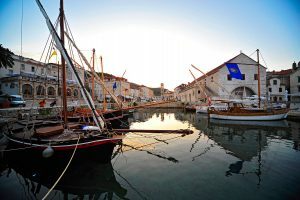 Take a history lesson in Škrip, the island’s oldest settlement that dates back to the Illyrians at Brač Native Museum before stopping for lunch at Konoba Kopačina in Donji Humac to try bizarre island bites. If you are lucky enough to get a booking, sip on the best of Brač wines in the charming barn-house at the humble Senjković Winery. The gap between Brač and the island of Šolta is known as the Gateway to Split and it is marked by Mrduja, a tiny islet with a rather interesting historical significance. For centuries there has been a dispute as to which island owns Mrduja so the islanders of Brač and Šolta introduced a rather witty solution to the problem. Every year, the opposing islands participate in a floating tug-of-war by tying ropes around the islet, attempting to pull it closer to theirs. Obviously this is all hopeless and so every year, the winners alternate and a Dalmatian feast marks off a friendly battle. This magnificent annual spectacle can be experienced with Šugaman Tours on their Blue Lagoon Special Edition with Tugging of Island Mrduja. One of the most unique natural phenomena in the world, the Blue Cave on island Bisevo will be a highlight of your holiday. With its silvery-blue color, created by light refraction of sunlight entering through a crack in the stone, it leaves nobody indifferent. Since the Adriatic sea around the Croatian islands is always crystal clear the shallow water inside the lagoon is immaculately clear so you can easily see all the way to the bottom of the sea. With it’s cape shifting sides with the change of wind and sea currents, Zlatni Rat beach in town Bol on island Brac is a world phenomenon. The beach is also ideal for families with children as well as the adrenaline junkies for the variety of water sports offered on the beach. Hvar town has a long and distinguished history as a center for trade and culture on the Adriatic.As one of the earliest tourist boards in Europe, it was founded in 1868 with the purpose of providing good care for visitors.